BP / Gulf Oil Spill – Slick Now Entrained In Loop Current? MODIS/Terra image, May 17, 2010, showing slick apparently entrained in Loop Current. https://skytruth.org/wp-content/uploads/2010/05/SkyTruth_dhrig_spill-modis-17may10-terra-interp.jpg 250 400 John Amos /wp-content/uploads/2016/08/test_logo.png John Amos2010-05-17 21:21:002019-03-04 14:13:39BP / Gulf Oil Spill - Slick Now Entrained In Loop Current? So how this compares to Exxon Valdez? According to Wiki it was about the same size as this one now, 11000 square miles (28,000 km2) of ocean but you think this is a much larger spill? What is the difference? Tim – the area of the surface oil slick isn't a good way to compare sizes. The oil here is being ejected at the seafloor over many days; Exxon Valdez spill was a near-instantaneous dump at the surface. Very different types of oil, in very different waters (temperature and salinity) with different bathymetry, winds, current, and shorelines. And different reponse efforts too. Volume-wise, the official Coast Guard estimate for the EV spill is about 11 million gallons. 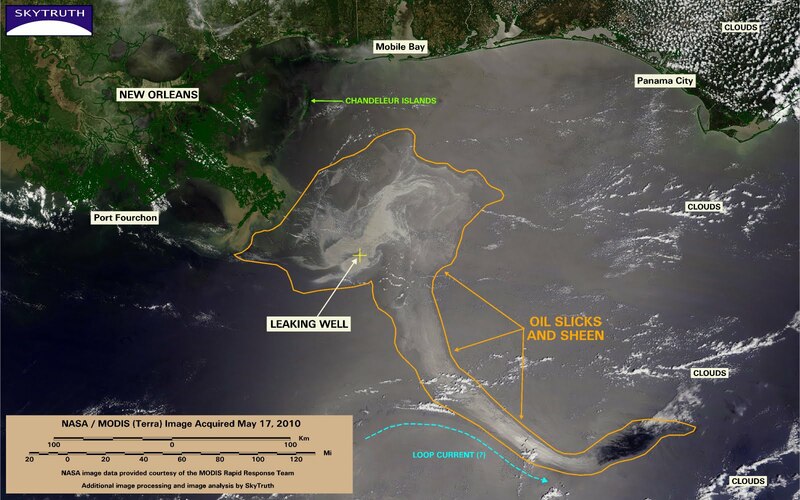 Here in the Gulf, at our estimated rate of 1.1 million gallons per day leaking from the well, we're closing in on 30 million gallons spilled so far. Our estimate is on the conservative end of the range of estimates scientists are now making based on analysis of the leak video. among the first ones, New York Times published this story: http://www.nytimes.com/2010/05/16/us/16oil.html which rapidly spread over other media. Even though the surfaced oil is already enormous and comparable to EV the real deal lurks beneath the surface. Guesses are the density of such oil is different thanks to the suspicious chemical dispersants used on the disaster zone and thus will not float like it would normally do. The samples are being identified right now and we will get the results soon. Some people argue that the volume of such huge plume would consist wide too much oil, but I don't think it's "pure" or 100% oil. Anyways, it's still very concerning – and very deadly if it turns out to be the crude from Deepwater Horizon. Are there any satellite sensors which can show how Coast Guard Admiral Landry is entrained in BP's bullcrap current? She is STILL acting as mouthpiece for BP. Skruffy – we'll have to get NASA working on that. Great find Tim – thanks for passing that along! This video is sharp, long, and apparently shot on May 16. The oil is now "officially" entrained in the loop current, and forecasts are being issues as to when it'll reach (or hopefully go by) the Keys, Miami, etc. 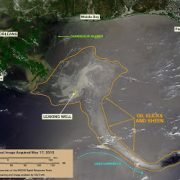 BP / Gulf Oil Spill – Video of Main Leak Supports SkyTruth Estimates –... BP / Gulf Oil Spill – How Big Is It?